Add a new line after the opening of "script"
Basically, you could do this without the "add qty to cart" function I've made, but I wanted to add in a little bit of error checking before adding something to the cart. If it's not a number, the qty will reset to 1 and continue to add the item anyway. 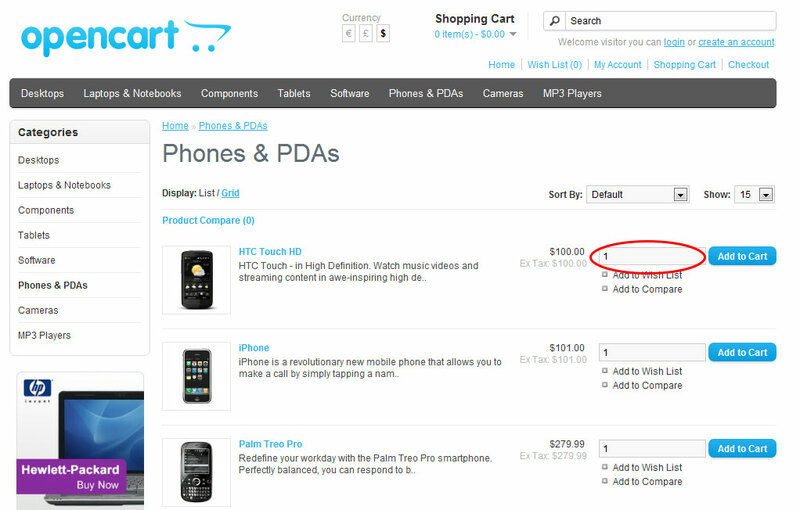 It still uses the function addToCart, but with the additional parameter which defines the quantity to add to the cart. Hope this helps someone out with quickly adding this to their OpenCart system, I did some googling prior to starting but sadly every solution I found demanded you pay at least $30. Which for an open-source product I thought was a little harsh of the community. Actually I thought it was pretty rude really, and down-right wrong. Don't get me wrong, I work on paid software solutions, but if you're going to use someone else's entire solution and add on a little "spit" of a feature.... Anyway. ENJOY. its perfect i change and style and look like very good. Hi, I’m using this function and it works great to add products from the category view- but I want to pass options to the cart by building on this function- I’m not having any success fiddling with it. Any help is appreciated! I have no idea sorry. It’s been a _really_ long time since I’ve used OpenCart. Might have to see if you can’t find someone on the OpenCart forums for assistance. Great thanks for this works. I am new in programming, but my site running in open cart 1.4.9.5 witch customize lot of php scripts. i am face problem time to time and find in Google. i think update to new opencart but i not decide witch version select. help me. Going for the latest version of something open source is really important for a number of reasons, but most importantly you want to ensure you use the latest version for security reasons. I haven’t touched open cart in a really long time so I can’t specifically tell you much about the newer versions but I believe this adding of qty to a category list page is no longer required as it’s built in now (I think…). Anyway – Always update your open sourced sites. Always always always. This worked with no problem for me in 1.5.6.4- I added the js to the common.js file under where the normal add to cart function was, and changed the other items as described even in a custom template with no problem. Thank you very much for the heads up. Do you have a solution for version 1.5.6? No, not at this stage. I haven’t done any work with OpenCart for quite some time. HI I have used this code to add quantity on product page. Working great Thanks!! But the issue I am facing is Quantity added is not updated in product page .If I click product link after adding quantity. Product page still shows quantity=1 that is adefautl value. Great thanks for this works like a charm! Quality that it’s all in the template and not in the core! Спасибо большое, просто и понятно. Thank you very much. Excellent! Very helpful for me 🙂 Thank you very much! works with 1.5.5.1 version as well. Hey Excellent! Thanks for the feedback! Hey Dazz – thanks for this, it’s been really helpful – only prob is when the category page has a filter applied, all the new quantity code disappears – any ideas? Can’t say I’ve had this feedback before. I haven’t touched OpenCart is a _really_ long time. I would suspect that the view used for the filtered pages is different to that of the normal category listing. If that’s the case, poke around a bit in the template view files to see if you can work out what the category filter controller is calling, and apply the same code on that view as well. 1.5.1.3 installation is over 12 months ago. You should really update to address security concerns among other things. If you have to stay on such an old version, you’ll need to review the changes made between the versions and selectively update the code yourself. Thank you very much 🙂 That helped me a lot. Wish you all the best. You are fantastic, thank you very much, in my country we don’t have access to USD , and I can’t buy any extension, your solution works like a charm. THANK YOU VERY MUCH. If you ever need some Spanish translation please let me know. Thanks for the code. I tried it on 1.5.4.1 and it didn’t work for me…what did I do wrong? Please help. Not sure. Only done it on 1.5.3 – but I would assume they would be similar. Triple check the changes you made to ensure they match what we have here. if yuo have a cache in sys folder the qty will be == 1, if cache clean –> allright… have thing’s ? It works!!!! Thank you so much. This is very god job! Thanks! Do you have a solution for version 1.5.1.3? This code adds an item to your cart, but only 1 quantity. I enter quantity 5, but conveys a cart in the 1 quantity. 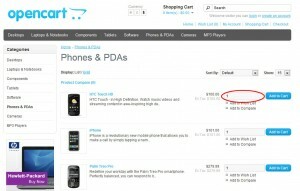 Upgrading to the latest version of OpenCart is not a solution for you? i have also this problem please provide these solution.. Worked a treat dude. I saw all the pay money solutions as well. No way I was going to pay for it before consulting my local Php developer. Just need to finish threaded comments properly (only the first threaded comment has the image/text in the right spot), and then once comments is done, add back simple facebook/google+ like buttons. Any suggestions on those? Still needs some work (focusing on the avatar and the border coming out). Biggest grief here is Wordpress’s functions and arguments passed through it’s comment’s function. I’ll finish him up tomorrow. Looks pretty epic to me. What happened to the mobile version? I thought you had one. It’s automatically detected. Boo >_> I’ll look into that further later on. Well, I still don’t have net so I probably could get onto a design. Got nothing else to do at night. It’s past monday! You should have intarwebz! OMG dude. I feel so sorry for you. You can come visit me, I’ll lend you wifi. And I don’t _need_ mobile theme (unless you’re really bored). Less than 1% of visitors are mobile device users. It’s most likely I’m the only one that has come on here with a mobile lately. Forms look awesome. Forgot all about the Submit button. Made myself laugh. And now back to work.